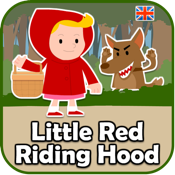 Little Red Riding Hood, a children’s fairy tale favourite, comes to life in this unique learning app, combining professional HD video storytelling and fun educational activities to help young learners of English across the globe, improve their language in a fun, engaging and memorable way. Stories are an invaluable tool in engaging children with language and encouraging discussion; developing speaking and listening skills and they are a great motivation for reading and writing- even for very young children. The full HD video of our professional story teller, along with beautifully-illustrated scenes from the story, provide young learners everywhere with a new and exciting way to improve their English through this classic fairy-tale. Our extensive research has shown that seeing the story teller’s face really helps the children understand the meaning of words, even more than just hearing or reading them. We’ve also provided a wide choice of interactive activities to bring storytelling to life in this age of mobile learning. Ideally suited to learners aged between 3 and 6 years old (with some knowledge of English), this ‘big screen’ app can be used at home, at school… in fact you can take our storyteller with you wherever you go. You can watch the movie again and again and enjoy learning how to tell stories with just your voice and body language. Each time they watch this lovely story learners can improve their fluency and language ability. - Little Red Riding Hood (HD) video, a children’s favourite fairy tale, expertly told by our British English speaking storyteller. - Read the story - flip through the beautifully-illustrated pages and either listen to or read the story yourself. Great for bedtimes too! - Flash cards - helps children learn new words and really understand the vocabulary in the story. - Share your story – help your children read the story and practise recording themselves. You can send the files to friends or family members too-they’ll be thrilled to hear it! - Word Quiz - race the clock to practise reading and matching the words, all spoken in a UK English accent. - Teaching Tips - over 20 creative activities and ideas for teachers, parents or carers to help children learn, have fun, and get the most out of this app. - Great for helping to develop literacy/learning English. Tip: Sound will not play if your iPad mute button is enabled. Please check first! Developed by Cambridge English Online Ltd (Winners of The English Speaking Union President’s Award 2011) with Day Two Productions (Winner of the Education Resources Award, 2012) with over 25 years of combined experience in creating fun, online and digital learning resources for learners across the globe. Don’t miss the ‘The Boy Who Cried Wolf’, and ‘The Hare and the Tortoise’ versions of this app, in both UK or US English! Check your local App Store for details.